In traditional construction, the steps of design and fabrication are often perceived independently from material behavior. On one hand, this lack of connection is a determining setback when there is a mismatch between fabrication drawings and the physical construction properties that often enforce builders to go through an expensive and time-consuming procedure of rework. On the other hand, prefabrication challenges on-site fabrication, especially when integrating natural and recycled local materials. Intrinsic materials with uncertain behavior which do not fit into standard processes of prefabrication, often cause constructors to opt them out and ignore their potentials. 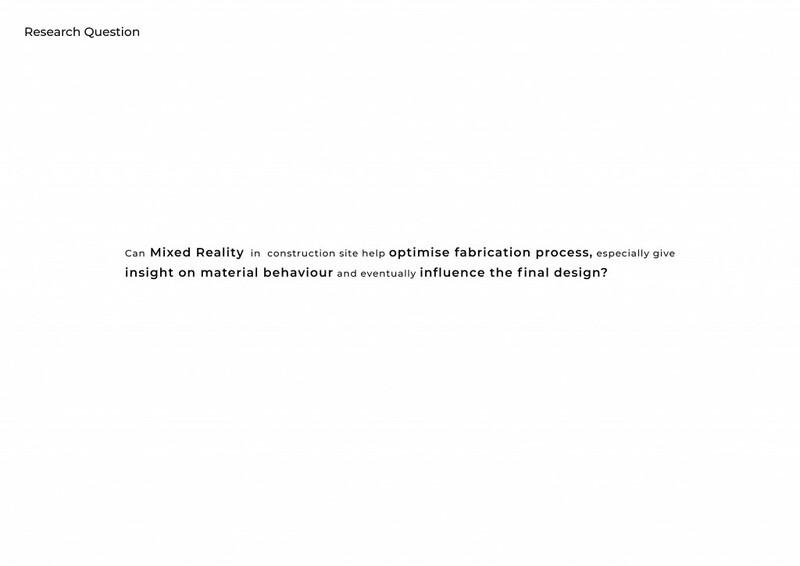 While digital fabrication is mainly being used for off-site prefabrication within a traditional workflow in the construction industry, this research proposes a new workflow for on-site fabrication by integrating design and making with uncertain material behavior through a Cyber-Physical System (CPS) consisting of Augmented Reality (AR) technology, 3D scanning sensor feedback and computational software to have an insight on material behavior, help optimize construction process and eventually influence the design. Overlaying digital data on physical fabrication model during the construction process enables manufacturers to have a real-time assessment of inaccuracies and miss matches between virtual blueprints and its physical entity caused by uncertain material behavior in dynamic conditions of construction sites. 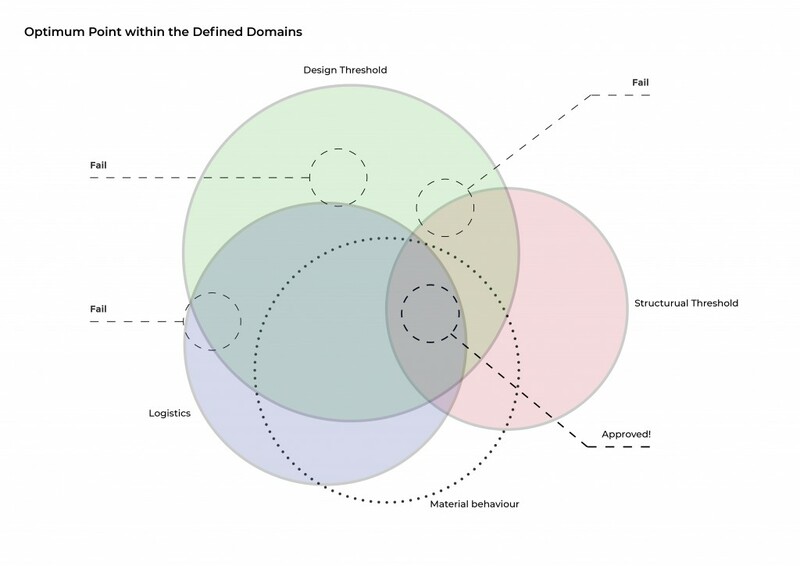 In this workflow, a design is investigated as something flexible within a certain set of domains such as aesthetics, structure, and logistics rather than something static. 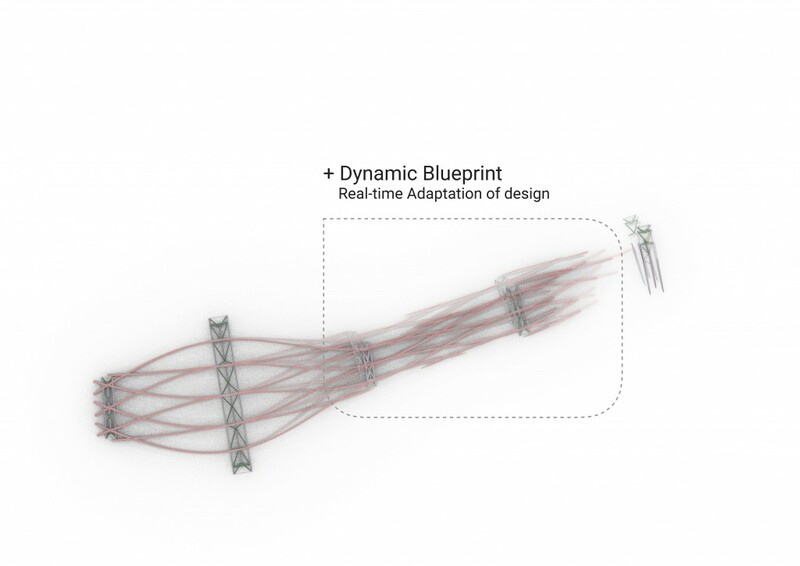 These parameters are quantified and fed into Computer Aided Design (CAD) software to generate optimized models as “dynamic blueprints”. 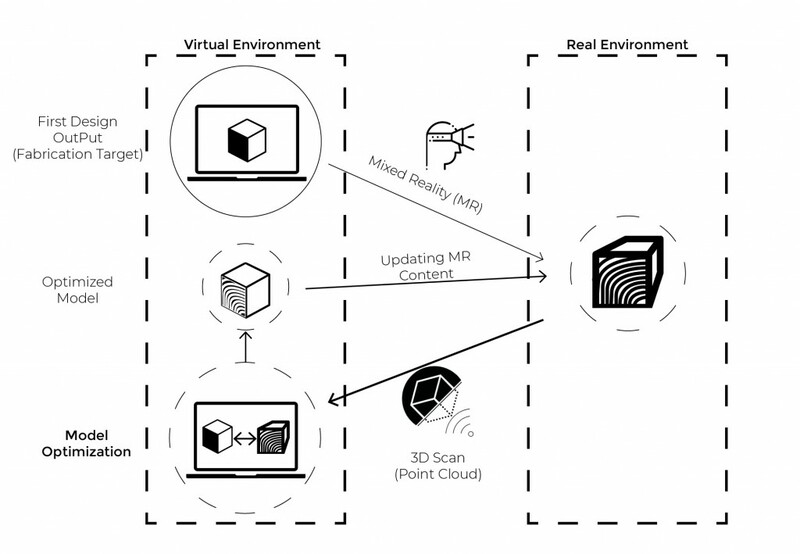 These 3D virtual models are visualized through AR as an updated fabrication model based on the feedback of the fabricated material and pre-validated domains of design. The workflow associates virtual design modeling tools with the physical environment and opens a new dialogue in between through AR platforms and devices which can deeply transform traditional practices within the building construction industry. Many types of materials used in the construction industry to create building and structures have a certain behavior so that it can be standardized into construction processes which is unlike the many of natural ones with intrinsic properties. Heterogeneous properties of some natural materials cause them to have uncertain behavior. 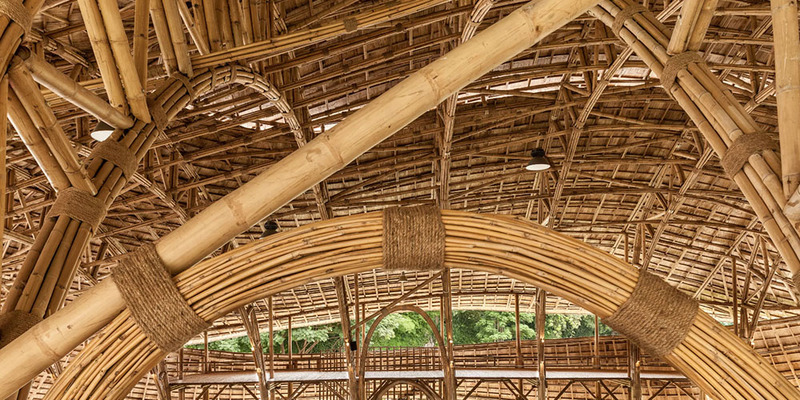 Construction methods used in the vernacular architecture could fit the uncertain behavior of locally found materials such as bamboo, through an on-site fabrication process. Using local natural materials can help to reduce the transportation expenses of construction and add a natural value to the buildings. 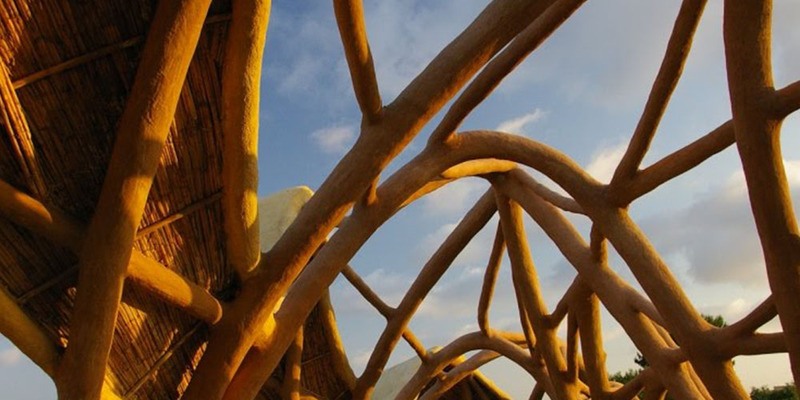 Natural materials exists all over the world and vernacular architecture have been using locally available materials to produce long-lasting, sustainable and low-cost buildings. Bamboo as a construction material is traditionally associated with cultures of Sout Asia, East Asia and the South Pacific, and some areas in central and South America and by extension in aesthetic of Tiki culture. Natural materials have a wide range of characteristics that can benefit the construction industry. For instance, bamboo structures that have a high structural value especially for the construction of lightweight structures. 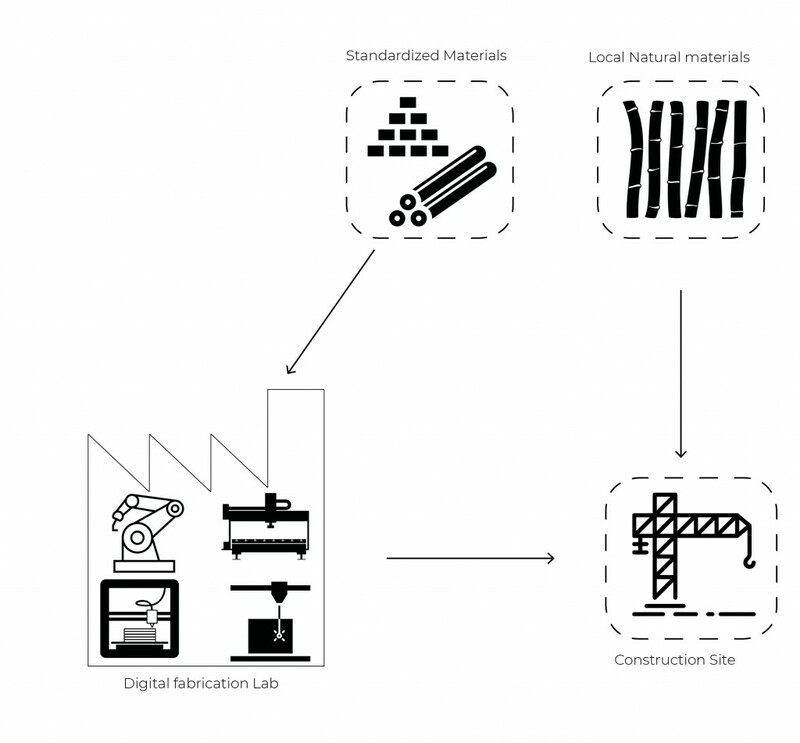 Digital fabrication has enabled manufacturers to use a wider range of materials with uncertain behavior; however, it has been used in controlled conditions of fabrication laboratories within the typical workflow of prefabrication. On-site construction using natural materials has yet not been able to adapt to the complexities of today’s architectural demands and still follows vernacular techniques and framework. 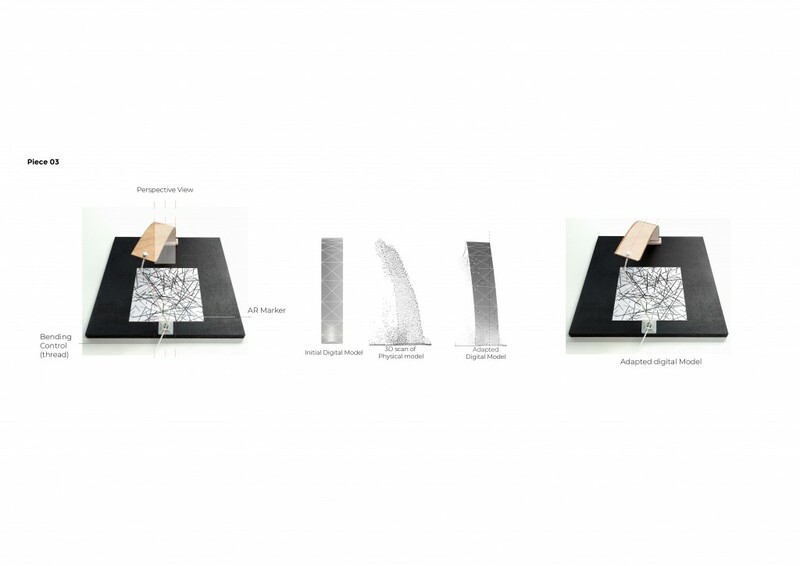 How can we establish a new workflow where heterogeneous materials are used for on-site fabrication? The traditional construction workflow consists of a linear top-down approach, and steps of the project life cycle are sorted one after another especially in constructions that utilize prefabrication and tries to gain control over the whole process of construction from one side to another. In this linear workflow when a problem is faced it is realized after execution, and then constructor has to go through a time consuming and expensive process of rework and replanning. 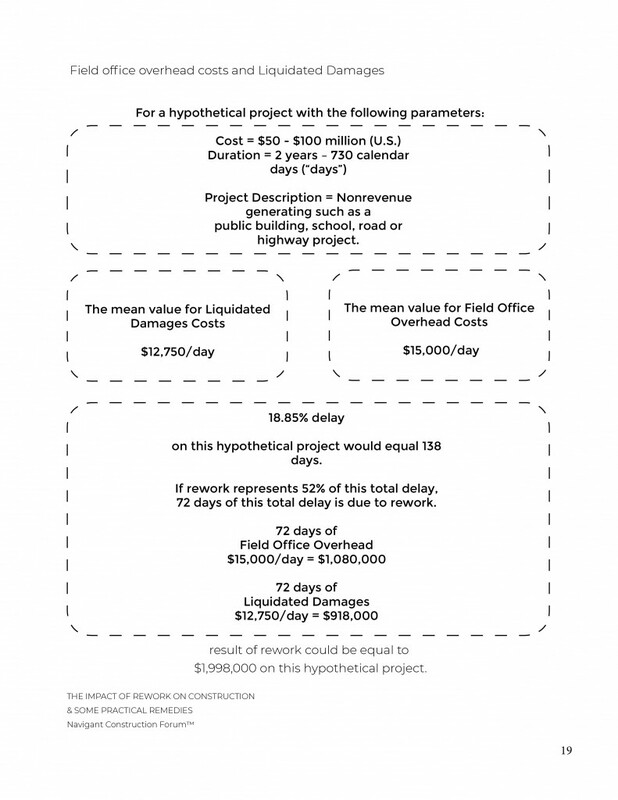 This often results in a long validation process between stakeholders related to the construction job. According to industry research, construction rework accounts for between 2% and 20% of average construction job cost. Rework is costing you big time! The process of rework starts with detecting an error and then stakeholders related to the construction job begin to make decisions and validate an alternative solution. Such a process in the typical construction workflow that has linear top-down approach is quite a time-consuming task which makes it impossible to work with materials that have uncertain behavior since they may need constant care and improvisation to update the construction plans and physical status of the fabrication job. 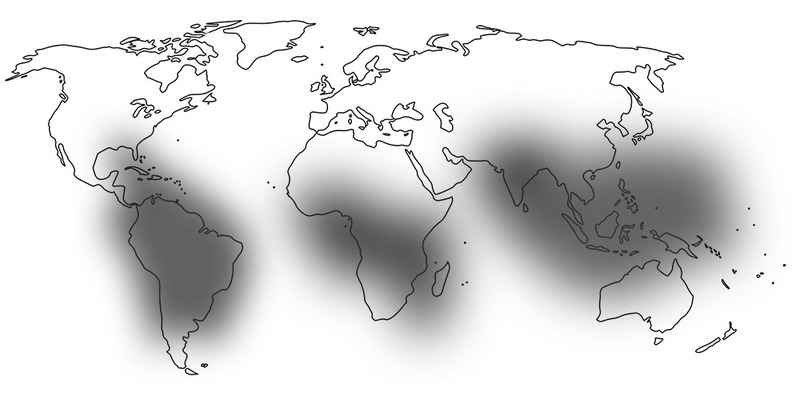 The aim of this test is to investigate the level of correlation between digital and physical environments. This test is associated with 3d scanning sensor (Tango) and marker-based Augmented Reality (Vuforia). In the first step, ten wooden stripes are cut in different orientations in relation to the wood grains. Heterogeneous properties of the material cause the stripes to have dissimilar forms when they are bent in a range of angles from 0 to 90 degrees. Bending wooden strips to match them to an Augmented Reality blueprint. Virtual models are designed using a physic engine to mimic a bent wooden stripe without considering its heterogeneous quality. Comparing the difference between the Digital model and the physical strips, piece number three is opted due to its most unexpected behavior. 3d scanning sensor is used to create a point cloud of the wooden stripe that helps to recreate the virtual model according to the intrinsic behavior of the material using Computational modeling software. Can these technologies open up new possibilities for a new workflow for on-site construction? On-site construction using natural materials requires a framework with fast decision-making processes to tackle the constant errors caused by the uncertain behavior of materials in the construction sites, where critical decisions are constantly made. This decision-making process and its consequent performance can be improved by enhancing situational awareness of the constructors through new digital technologies. Merging the steps of planning and execution in a mixed reality environment unfolds the physical and digital realms simultaneously through a real-time updating system. Integration of MR technology, 3D scanning feedback, and CAD software can create a cyber-physical system for on-site construction. Such a system provides fast and comprehensible access to progress information to enable comparison to the as-built status as well as to as planned data, detect construction errors, and send 3D scanning feedback to CAD software that simultaneously analyzes and provide validated alternative solutions. 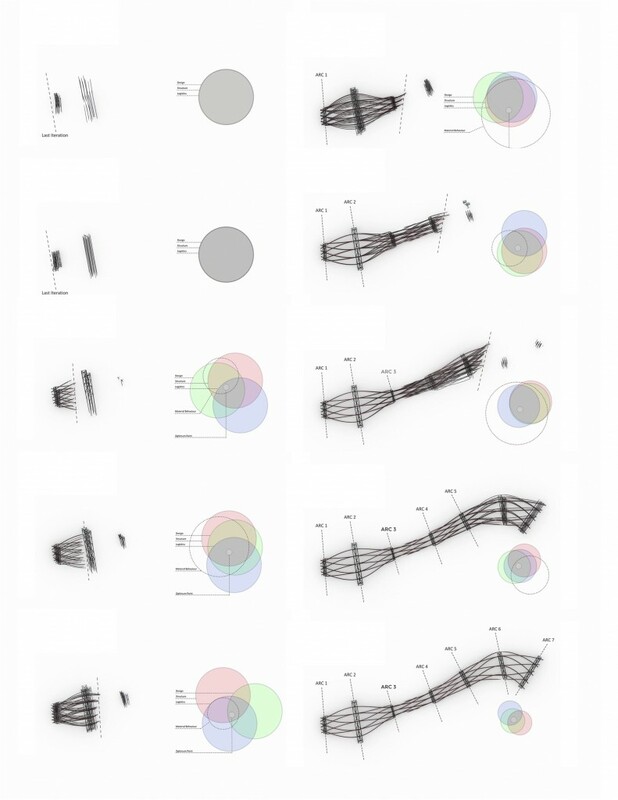 The outcome of construction with materials that have uncertain behavior could not be predetermined a priori in a digital model, but rather emerged out of the negotiation among design intentions, fabrication constraints, performance criteria, material behaviors and specific site conditions, in which the moment of design unfolds simultaneously with fabrication, informed by a constant flow of sensory information. In this Test, a truss structure is fabricated following Holographic AR blueprints. Bamboo rods are chosen for its heterogeneous properties which makes it have uncertain behavior while fabrication. The truss structure is an arc and a part of a larger hypothetical structure. During the fabrication, the differences between 3D virtual blueprints and the physical structure are constantly monitored and the user tried to follow the virtual guide as much as uncertain behavior of the material allows. 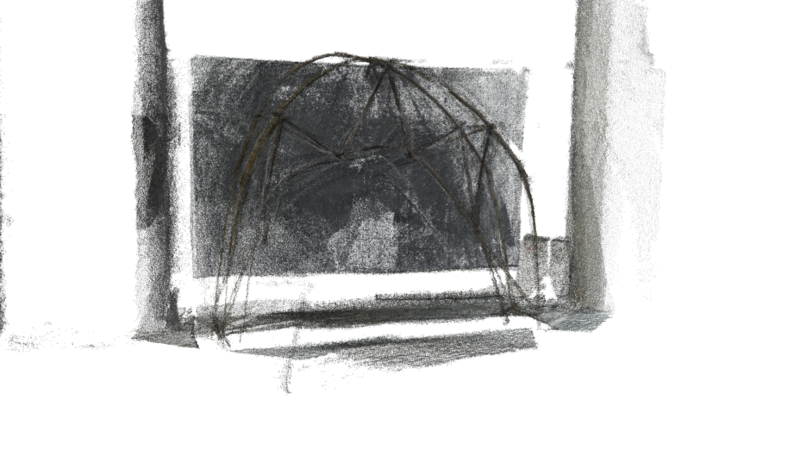 The structure is then 3D scanned (Tango) and the point-cloud created is sent to the CAD software (Grasshopper) for structural analysis. CAD software (grasshopper) analyze the built structure and simulates uncertain behavior of the material and therefore its form. Analysis of the model unveils its structural performance and check if it is within a pre-defined domain based on the general strength of the bamboo rod. The fabricated Arc is a part of a larger hypothetical structure. The whole fabrication process is simulated and fed with the data received from 3D scanning the structure. This simulation shows how this workflow works using AR technology that provides dynamic blueprints. Real-time adaptation of design during the fabrication need a constant update on fabrication blueprints and information. This constant improvisation generated by CAD software is used at different fabrication steps of the construction process. Design intention such as the degree of freedom of arcs for placement, orientation, structural performance, and logistics are quantified within validated domains that control the simulation and the improvised solutions. Real-time improvisation using such a workflow requires to quantify design through computational approaches and define the determining parameters of a construction project within pre-validated thresholds. Uncertain material behavior can affect so many aspects of a construction project such as aesthetics, structure, Logistics. 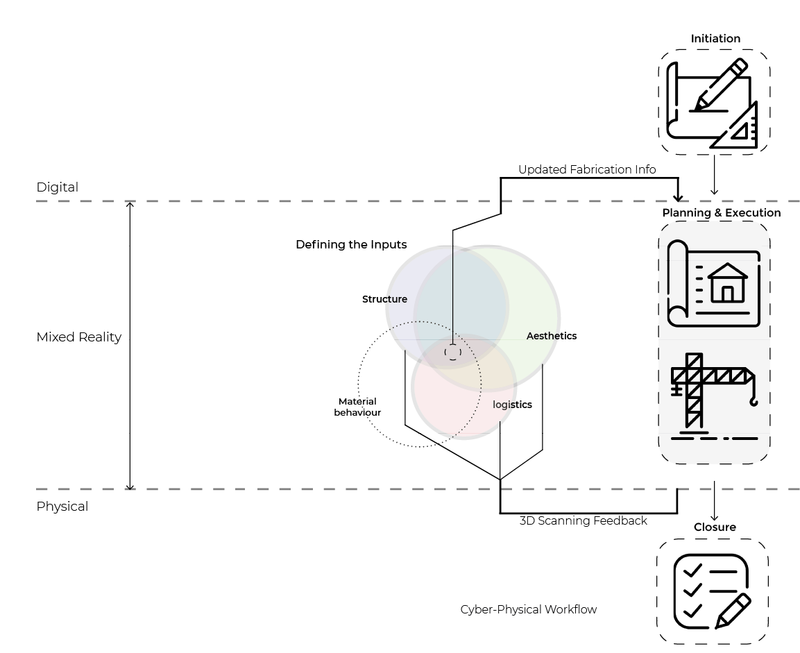 Pre-validation of these parameters and prioritizing them using CAD software allows to define design intentions within quantified domains and automate the improvisation process. 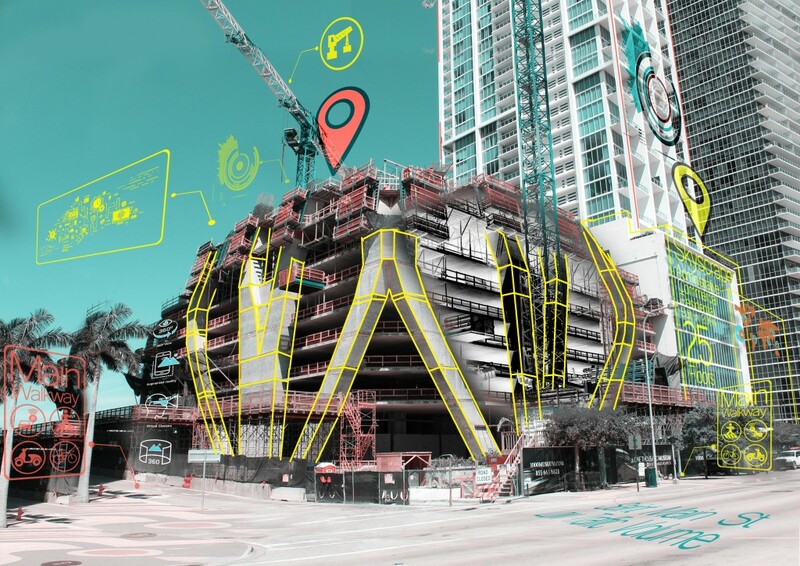 This means when constructors detect a problem using 3D AR visualization and sensor feedback, there is a pre-validated alternative solution at different steps of fabrication along with fabrication data that allow construction workers to apply new changes based on the updated AR blueprint and fabrication information. Finding the optimum point where all validation parameters are respected during the construction for each fabrication step based on real-time 3D scanning feedback. Overlaying digital content on the physical world bridges the gap existing between virtual environments and the Reality. AR Visualize geometrical differences between digital blueprint and the digital fabrication component that simplifies and hasten fabrication processes. Integration of 3D scanning technologies provides an analytical control over structural performance and allows to improvise the digital design based on the physical model. 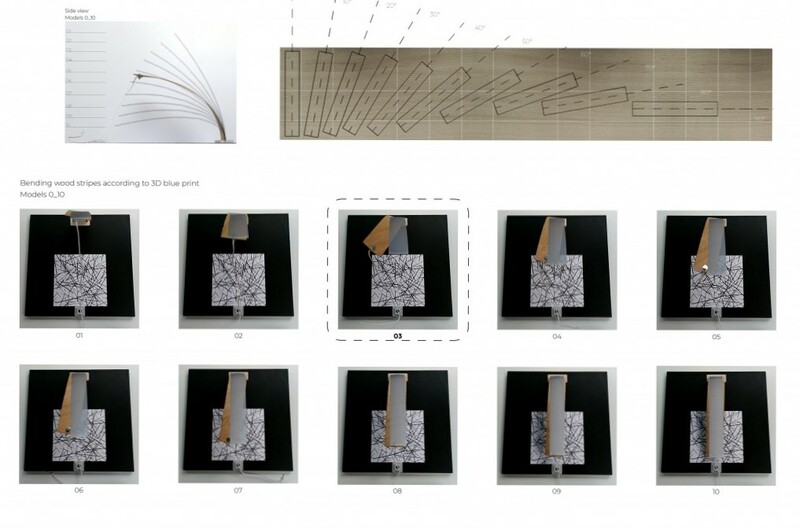 This Thesis proposed a new workflow using state of the art technologies that enable architects to integrate vernacular architecture techniques with the advanced and complex computational design which can lead to new forms of construction and transform traditional practices within the building construction industry. How can we define design as something not static but flexible within a certain threshold?